Are you looking to feed your dog more nutritionally complete meals, while avoiding harmful ingredients? Are you looking to save money on your fur baby’s food? Or is your pet on a special diet? If you’ve answered yes to any of these questions, then you’ve come to the right spot! We’re here to help you create the healthiest homemade meals for your pet! 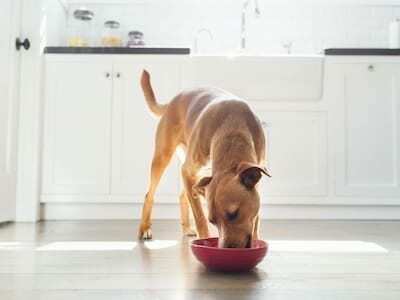 In this article, we’ll take a look at the reasons some pet parents choose to make homemade dog food, and help you start out with some recipes we’ve put together. First, let’s move on to the reasons for making homemade dog food. These days, grocery stores, pet shops, online shops and more make it easy to buy your dog’s food. You’ll find a huge selection of brands and meals to choose from—so many it’s difficult to find which food is best for your canine companion. With this wide variety of brands and meals to choose from, why would anyone decide to make homemade dogfood for their pet? 1. Commercially prepared pet food is not regulated: human food is covered by many laws and regulations that have to be met when it comes to labeling, nutritional requirements, etc. However, the pet food industry lacks comprehensive regulations to make sure pet food meets specific health requirements for pets. Federal agencies do provide guidance to pet food producers, but they have no regulatory powers. 2. Pet food recalls: in recent years, we’ve become all to familiar with the round of pet food recalls due to safety issues with the food. It’s difficult when we must depend solely on the word of the manufacturer that they use hygienic processes and only quality ingredients in their pet foods. 3. Harmful or unnecessary ingredients: commercially prepared pet foods may sometimes include harmful ingredients or ingredients that are unnecessary for your dog’s diet. Accidents can happen during the manufacturing process that lead to pet food recalls. You can avoid fillers that add calories and zero nutrition for your pet by making DIY dog food. While sold in the U.S., some pet foods are actually made in other countries, where the manufacturer includes whatever ingredients they’d like. These foods can sometimes be poisonous or otherwise unhealthy for your dog. In addition, if your fur baby has a specific health problem, such as allergies or another medical condition, they may need a special diet that excludes certain ingredients commonly found in manufactured pet foods. 4. Improve quality: homemade dog food gives you control over all the ingredients. You can avoid those your pup may be allergic to or need to avoid for other reasons. You can also improve the quality of his food by using only healthy, high quality, fresh ingredients. 5. Provide more variety: not only can you ensure the food’s more nutritious and higher quality, but you’ll also be able to serve your dog a wide variety of meals. Rather than giving him the same old food every day (unless this is what he prefers! ), you can serve your fur baby more variety and flavors in his meals. What dog wouldn’t like that? 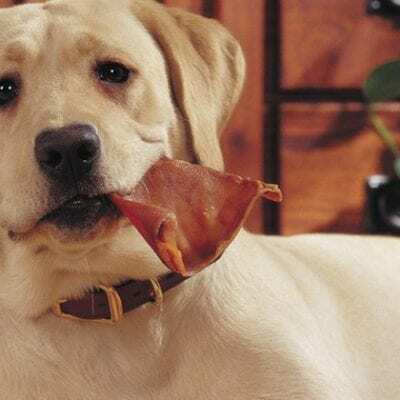 Well, there may be some that prefer the same thing every day, but there are definitely dogs who would love to experience a wider range of foods and flavors! 6. Save money: commercially prepared pet food can be expensive, especially if you want to provide high quality food for your fur buddy or he needs a special diet. On the other hand, cooking your dog’s food at home, while it does cost time and labor, will save you money in the long-run. Buying ingredients in bulk and then cooking your pet’s meals for several days save money, while providing high quality, healthy food for your furry friend. Not only that, but all the ingredients you’ll need are already available at your local grocery store. These are only a few of the reasons pet parents are increasingly turning to homemade dog food. Next, let’s take a look at some tools you’ll need to make DIY dog food. And of course, make sure your kitchen is clean before you start. You’ll want to keep your pup’s food safe and free of harmful bacteria, so be sure all tools, dish cloths and towels, kitchen surfaces and utensils are clean before you start cooking. Be sure to wash your hands before you start—for the same reason—to avoid introducing harmful bacteria and substances into your DIY dog food meals. Now you’re ready to consider some healthy ingredients! Meat and animal organs: should be about ½ of your dog’s diet. Make sure to use lean meats, and remove any skin and fat. Be sure to include sources of red meat and poultry in your dog’s diet. You might even choose to include fish and lamb, if your dog likes these. When it comes to organs, liver is a very healthy option for your dog—especially beef liver. You can also include others such as chicken liver, etc. Only use about 5% of organ meat in your dog’s overall diet. Eggs: a great choice for your fur baby’s food! Dogs 20 lbs and over can have one egg a day, while smaller dogs should have less. Dairy: including yogurt, cottage/ricotta cheese are healthy choices for your pet. Don’t use too much dairy, however, as it can cause digestive problems in some dogs. Fruits and veggies: these are generally not thought of as part of a dog’s natural diet. However, they can provide needed fiber and nutrients. If you choose to use veggies and fruits, be sure to cook them down first. They should be very tender—not crisp. Dogs have a hard time digesting plant material, so cooking it down will aid his digestion. Your dog may be happy to have potatoes, squashes, beans and more added to his diet. Just be sure to check with the vet to see which veggies and fruits are safe for dogs before including them in your pup’s diet. Be sure to avoid onions and garlic which can be harmful to dogs! 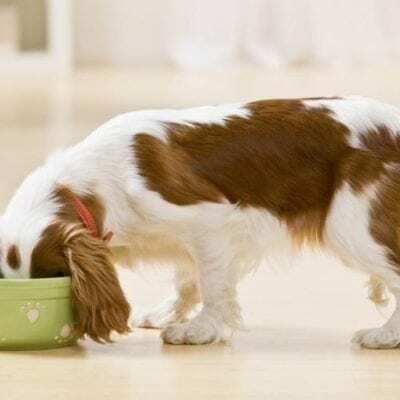 A DIY dog food diet can be an excellent choice for your dog, but you may need to add supplements to the food or give your dog vitamins to make sure he’s getting all the nutrients he needs each day. Homemade meals may not always have the nutrients your dog needs in a 24 hour period. If you have a question about this, be sure to check with your veterinarian for their advice on making sure your dog gets all the nutrients he needs. Also, be sure to check with your vet for the proper portion size to give your pup! This will vary from commercially manufactured pet food. Your vet will have the best advice on how much to serve your dog to keep him happy and healthy. Now, we’re ready to look at some homemade dog food recipes! Here are some recipes for homemade dog food made with chicken. This is a fast and easy recipe that’s easy to make in bulk for your fur baby. 1). Place chicken, vegetables and rice into a large sauce pan or Dutch oven. Stir in water until the mixture is smooth. Place over medium-high heat and bring to a boil, stirring constantly. 2). Reduce heat to medium-low, cover and simmer until the rice is tender and all of the liquid has been absorbed, about 25 minutes. Cool completely before serving; store covered in the refrigerator (can be safely stored for up to 4-5 days). Here’s another easy recipe to make for your fur baby, which is made in the crock pot or on the stove! You’ll save time and money using the crock pot for this recipe! 1). Add all ingredients, except peas, parsley, and olive oil, to the slow cooker. 2). Use just enough water to cover ingredients. 3). Cover and cook on low 6 to 8 hours or high 4 to 5 hours. About 15 minutes before turning off the slow cooker, add peas and parsley. 1). Add all ingredients, except peas, parsley, and olive oil, in a large pot or Dutch oven. 2). Use enough water to cover ingredients. Bring to a boil and reduce to a simmer. 3). Cover and cook on low 1 hour or until carrots are tender and chicken cook through. About 15 minutes before turning off, add peas and parsley. When everything’s finished cooking, allow ingredients to cool slightly. Using a slotted spoon, add ingredients, and olive oil to a mixing bowl and either, mash with a fork, potato masher, or use a food processor (or blender), depending on the consistency preferred. You can use a food processor or blender and pulse the ingredients about 3 to 4 times, until the consistency is similar to canned dog food. Allow to cool completely before dividing into freezer-safe zip bags or containers. This doggie stew is easy to divide and store in individual servings in the fridge or freezer. Be sure to allow frozen foods to completely defrost overnight. Then you can heat the food before serving it to your dog. This recipe is another one that can save time by using the crockpot. These healthy ingredients are sure to make your pup very happy at meal time! 1). Put all ingredients into the crockpot in the order given (layer, don’t mix). 2). Cook on low for about 8 hours, on high for about 5 hours. 3). When done, stir, breaking up the chicken into small pieces. Everything will be quite soft. Refrigerate unused portion; can store in fridge for up to three days or in the freezer up to 2 months. If you have an instant pot, this recipe if for you and your pup! 1). To your instant pot, add the rice, and place the chicken breasts on top of the rice. Add the rest of the ingredients. 2). Next, add the water. 3). Cool on manual high pressure for 25 minutes. 4). Natural release for 10 minutes. 5). Manual high pressure for 25 minutes and natural release for 10 minutes. 6). Allow to cool and then serve to your dog. This meal can be divided up into individual servings and stored in the fridge (for up to 3-5 days) or in the freezer for up to 3 months. Here are some DIY dog food recipes that won’t break the bank, but will give your fur baby the taste he loves! 1). In a large saucepan of 3 cups water, cook rice according to package instructions; set aside. 2). Heat olive oil in a large stockpot or Dutch oven over medium heat. Add ground turkey and cook until browned, about 3-5 minutes, making sure to crumble the turkey as it cooks. 3). Stir in spinach, carrots, zucchini, peas and brown rice until the spinach has wilted and the mixture is heated through, about 3-5 minutes. 4). Let cool completely before serving. Note: be sure to thoroughly cook the carrots and peas before adding them to this recipe. These veggies can be hard for dogs to digest; cooking in advance will make sure they’re completely tender (not at all crisp). It’s easy to boil these for about 10-15 minutes or steam until fork-tender. This recipe is easy to cook and easy on your budget! Your pup will love this slow-cooked ground beef dinner you can just throw into the crock pot! 1). Stir in ground beef, brown rice, kidney beans, butternut squash, carrots, peas and 4 cups water into a 6-qt. crock pot. 2). Cover and cook on low heat for 5-6 hours or on high heat for 2-3 hours, stirring as needed. 3). Let cool completely before serving. Maybe you prefer giving your fur baby a raw food dog food diet. If so, here are a couple of recipes he’ll be sure to love! Raw diets are not recommended for puppies under the age of 12 weeks. 1). Put the minced and organ meats into a very large mixing bowl/tub. 2). Par-cook (boil) the veggies until soft. 3). Add the other ingredients. 4). Mix well with gloved hands or a large spoon. Be sure to check with your vet if you have any question about portion sizes. They’ll have the best recommendation, as they know your pet’s overall health and weight. This food is best divided into individual serving portions and then put into the freezer. You can keep out one bag over night, but no longer. Note: it’s important to thoroughly clean the countertops, utensils and other tools used when you make raw dog food. 1). Cook the rice and pumpkin together until soft, and allow to cool. 2). Par-cook (boil) the peas and carrots together until tender and soft. 3). Mix in the raw ingredients. 4). It’s ready to serve in the portion sizes determined by you and your vet. Note: This recipe can be frozen up to 2 weeks, or kept in the fridge for 3 days. It’s a good idea to break this recipe up into individual servings and then store. What if you’d prefer to serve your fur baby dry dog food, but would still like to make it homemade? We’ve got you covered! Read on to find two DIY dry dog food recipes your pup is sure to love! 1). Put the rice and lentils in a saucepan and cover with the water. Bring to a boil, then reduce the heat to medium and cook for 20 minutes. 2). Once the rice and lentils are cooked, add the chopped carrots, sweet potato and apple to the saucepan. Stir in the oats and chopped herbs and gently simmer for 20 minutes more. Add an extra cup of water if the mixture appears too dry. Preheat the oven to 350 F (180 C). 3). Meanwhile, brown the ground turkey in a separate frying pan—about 10 minutes. 4). Put half the cooked vegetable and grain mix into a food processor (or blender) with half the cooked turkey, add half the oil and pulse until the mixture resembles a thick puree. 5). Grease 2 cookie sheets and spread the mixture onto one of the sheets so that it’s about ¼ inch thick. Be sure to keep it the same thickness across the cookie sheet to ensure even cooking. Do the same with the second cookie sheet. 6). Place both cookie sheets into the preheated oven and bake for 45 minutes. Turn the kibble over to make sure it dries all the way through, and cook for another 30 to 45 minutes. When these are done, they should look a bit like big cookies. It’s important to make sure these have cooked all the way through. There should be no moist/soft spots, otherwise the food will mold. If necessary, leave the kibble cookies in the oven another 20 minutes or until completely dried. 7). Reduce the oven temperature to 325 F (160 C). Remove the kibble from the oven, cool slightly, and then cut into small pieces. Place the pieces back onto the cookie sheets and back for an additional hour, or until kibble is completely dried, but not burned. 8). When finished, remove the kibble from the oven and let cool completely. This will keep in the fridge for up to 10 days. 1). Preheat oven to 200 degrees. In a skillet, cook the ground meat until browned. Grease a cookie sheet and set aside. 2). In a large bowl, combine the flour and milk powder. In a smaller bowl, beat together the eggs, vegetable oil, Worcestershire sauce and water or broth. Slowly add the wet ingredients to the flour mix and mix well. Stir in the ground meat and veggies. 3). Spread the “dough” onto the cookie sheet, making sure to keep it at an even thickness of about ½ inch. You may need to use a second cookie sheet if the dough is thicker than this on the first cookie sheet. 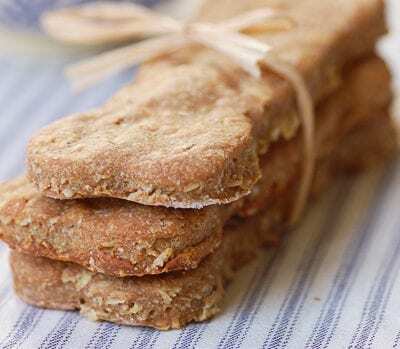 Using a knife or pizza cutter, score the dough into bite-sized pieces (appropriately sized for your dog and his breed). 4). Place the cookie sheet(s) in the oven and bake for one to two hours. Turn off the oven and let cool for one to two hours. Remove dough from the oven and break on the scored marks. Store your DIY kibble in an airtight container in the fridge—it can be safely stored for up to three days. You can also freeze it for up to three months. We’ve covered a wide variety of cooking methods and recipes for your DIY dog food. We hope this guide helps you learn how to make healthy homemade food for your fur baby! I’m all in for homemade dog food. I actually noticed that my dog always get stomach upset whenever he’s fed something from the store. For the sake of his health I just have to switch to homemade food and honestly, I think it’s a very good thing. my dog friend had same issue but that was when I tried a certain new brand. That period was scary because we spent days going to the vet and after that, I need no seer to tell me to stick with homemade. Jeez. It’s a good thing you boldly highlighted avoiding onions and garlic which can be harmful to dogs. I almost skipped it and I had it in mind to add to my dog’s food! Thanks for drawing that to my attention. Oh my, that definitely wouldn’t have gone well. I’ve seen people bring in their dogs here because it was fed onions or garlic maybe by mistake. I’ll spare the details but trust me, it’s really not an experience you need. Woohoo! Chicken and Veggies is definitely up next. I have an instant pot and I’m sure trying out this dog food recipe. It looks super easy, healthy and affordable. I can imagine how much I would have spent getting this outside. OMG. Lots of dog food recipes to treat my dog to. You know it’s funny how we prefer to spend a fortune on unhealthy dog foods sold at the store when we can make at home with almost half the amount needed.